Patients frequently present with a reduced awareness of their affected side following a stroke or brain injury. This decreased awareness can be a visual field cut or a hemi-spatial neglect or both. Here are some ways to tell just why your patient cannot find half of the world. Note right side of brain attending to left and right side, left side attending to right side. This leaves only right side attending to left side which makes for higher incident left side neglect. A stroke with neurological neglect is generally associated with middle cerebral artery strokes. These are the most common strokes. The temporal/parietal lobes tend to be affected in these strokes with hemiplegia also occurring. 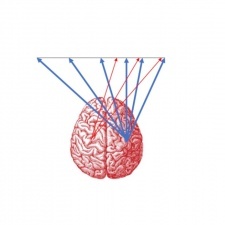 Because of redundant connection for attention in the left side of the brain (the right side attends to left and right while the the left side attends to right, making both sides attending to the right…see photo) left side neglect with right side affected CVAs are more common. Generally, a true field cut is associated with a posterior cerebral artery stroke with the occipital lobe being affected. This is stroke is less common. The patient may not have any other symptoms from the stroke. There are many difference functional in patients that have neglect vs field cut. They do not compensate well. This is probably related to the lack of insight. Problems with attention in general. Perseveration (unable to shift attention) and distractibility are common. Patient with neglect have difficulty with crossing midline. The eyes may not track across midline to affected side. Slow saccades to affected side. Poor search patterns on cancellation tests. These patients randomly search for targets. It is important to watch how a patient completes cancellation assessments as a patient with a field cut and neglect will have similar looking cancellation tests when completed. These patients tend to be oriented (posture and head position) away from the affected side. Saccade activities into affected side with minimal head movement. Reducing head movement is important in remapping visual space. Hold the patients head still if needed. Field cuts tend to be a bit easier and are discussed here. Neglect and fieldd cuts are common consequences to stroke and confusion about just what the patient is experiencing can make treatment difficult. I hope the helps!!! Learn more about this subject in a live course and webinar presented by Robert. Hosted by PESI Education. This entry was posted in occupational therapy, stroke, vision rehabilitation and tagged field cut, hemispatial neglect, learning disabilities, neurological rehabilitation, occupational therapy, stroke, vision rehabilitation. Bookmark the permalink.